Phoenix dactylifera is a useful traditional medicinal plant, mainly the fruit is used, which is the edible part of the plant (Ajwa date). It is now considered to be a valuable source of natural medicinal products against various diseases. Phytochemical investigations have shown that the fruit contains anthocyanins, phenolics, sterols, carotenoids, and flavonoids. The fruits are a rich source of carbohydrates, vitamins, and proteins. P. dactylifera is considered as a complete diet because it also contains different fatty acids, amino acids, proteins, and steroidal substances. 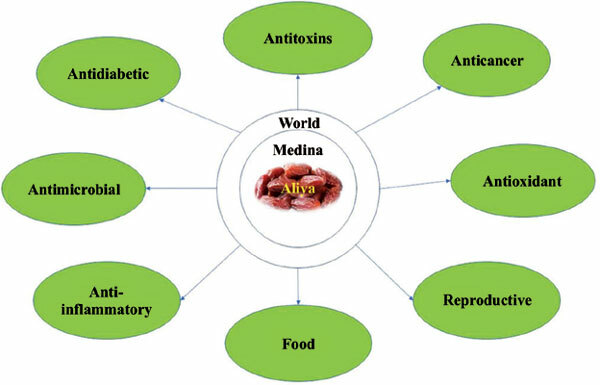 This review highlights the phytochemical composition, nutritional significance, and potential health benefits of P. dactylifera and discusses its potential as a functional food for disease prevention, management, and treatment. Phoenix dactylifera, biological activities, phytochemicals, future directions, drug discovery, medicinal plant.